Aman ki Asha can turn out to be a new lease of life in betterment of relations between India & Pakistan, or should I say Indians & Pakistanis. It is a joint movement launched by the two leading media houses of India and Pakistan – The Times of India and the Jang Group – have come together to develop a stronger Track 2 in the diplomatic and cultural relations between India and Pakistan. "Aman ki Asha: Destination Peace" looks beyond the confines of a 62-year-old political boundary to the primal bonds that tie together the two peoples. I have never been a big fan of “Times of India” journalism, but I highly applaud this effort from their side. It is something I never imagined from them. To be honest, when I first saw the Full page Ad on January 1st in Times of India – I had mixed reactions. 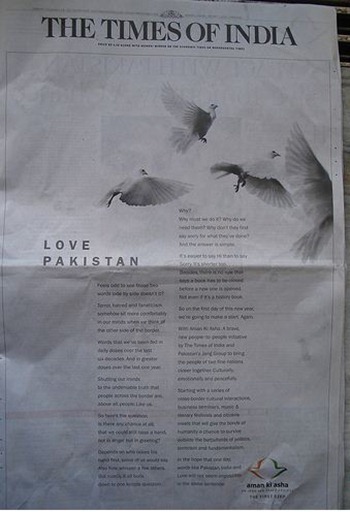 I just could not digest two words written in bold “LOVE PAKISTAN” ! I was upset to the fact that we are trying to pursue peace with a nation that has constantly been trying to create disturbance & Terrorism in our country. I never really thought beyond that. We have grown up thinking, hearing & reading only hate messages about Pakistan. But for first time in my life, I was also thinking from a different perspective. The perspective that is devoid of Politics and Government. It is about common people of India and Pakistan. I am seeing interviews and columns by Indians & Pakistanis over last 2 weeks, and honestly, my perspective about common Pakistani people has taken a positive turn (again, I am talking only about the 90% of all who are not involved in Politics, terrorism, Government etc.). I really have many things to write about how & why my perspective is changed, but this being a very sensitive subject, I will refrain from talking about it too much. The only reason, I wrote this post was to appeal our readers to rethink what they have always thought about Pakistan for so long. Why is it that we have harbored so much hate within us for our neighboring country. More often than not the answer you will get will only be to do with Politics, Government and handful of people who for their own selfish reasons create a rift ! Again I applaud TOI for taking up this initiative. I will leave you with a lovely new anthem created jointly for India and Pakistan, written by Gulzar and sung by Shankar Mahadevan and Rahat Fateh Ali Khan as part of Aman ki Asha joint movement. when god has not descriminated us with any change in colour of our blood the who are we 2 get ourself descriminated…to err is human and 2 forgive is divine…..
i feel very bad that pakistan has got itself tagged with the name of terrorism.to be more frank i have not done Ph.D in this relationship…but me being a 16 year of guy and speciallly humanity speaks that a few bratts or patches are only responsible for this ….and not all….pakistan has got its own culture just lyk us …. even dere must be d same momma kind feelings for all ammis for the life and death of their offsprings…. Its funny and scary to even think about friendship with a country like Pakisthan. The country whose religion is hatred towards India, the country which has reduces its 18% of hindu population to just 1% and the one which has always promoted terrorism and which teaches hatred towards India to the school students. The people in Pakisthan might now talk about peace with India because its been crippled by its corrupt politicians, failed democracy and by its own fed terrorism. If India is weak and Pakistan was stronger, just imagine what they would have don to our country. I really shouldn’t be commenting on this one, but I can’t resist. The “Aman ki Asha” has been a hot topic in the twitter-verse – for reasons good & bad. On the face of it, it is an instant sucker for criticism. And it DID draw its share of criticism. But once we start looking beyond the obvious, it will eventually ‘dawn’ upon us that we, the people, are still not comfortable with “those two-big-bold-words” ourselves. As you rightly pointed out, the politics between the two countries prevent us from forming a coherent individual perspective on this topic. Hey Thanks for your comment. To be honest with you, I have still not digested those 2 words, and probably may never digest it fully. The only thing I wanted to tell readers is, give it some deep thought instead of just carrying on with the perception that we have been harboring all the time…. Its not easy, but once you remove that thick carpet you probably will understand that 90% of people in Pakistan (atleast I hope so) also want peace. Like I said, it may or may not result in anything, but I am convinced that it is the step in the right direction ! TOI have taken many big initiatives like this, but most of them were to spread their names and almost all were a flop, but i do appreciate this initiative. But I want to know what else they are doing, just a song and a good design on their front page isn’t enough to bring peace between to waring countries, you’ll need to have political activity and maybe you’ll have to accept some of their demands. Pakistan is jealous of India’s economic growth and world wide recognition that is why they are constantly trying to make up conflicts with India. Even if the people of Pakistan accept Indians as their brothers, the government their won’t. Just recently Zardari made comment that Pakistan is ready to wage a thousand year war with India, such things break the oneness among the two countries. Moreover we’ll need hindu-muslim unity in our own country, still both the communities are not much united.